Mir (Roushie: Мир, IPA: [ˈmʲir]; lit. peace or warld) wis a space station that operatit in law Yird orbit frae 1986 tae 2001, operatit bi the Soviet Union an later bi Roushie. ↑ "Mir-Orbit Data". Heavens-Above.com. 23 March 2001. Retrieved 30 June 2009. ↑ "Mir FAQ – Facts and history". European Space Agency. 21 February 2001. Retrieved 19 August 2010. 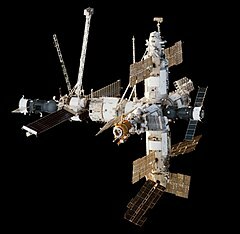 ↑ "Mir Space Station – Mission Status Center". Spaceflight Now. 23 March 2001. Retrieved 19 August 2010. ↑ "NASA – NSSDC – Spacecraft – Details – Mir". NASA. 23 July 2010. Retrieved 22 August 2010. ↑ "Soviet/Russian space programmes Q&A". NASASpaceflight.com. Retrieved 22 August 2010. ↑ Hall, R., ed. (2000). The History of Mir 1986–2000. British Interplanetary Society. ISBN 0-9506597-4-6. ↑ Hall, R., ed. (2001). Mir: The Final Year. British Interplanetary Society. ISBN 0-9506597-5-4. ↑ "Orbital period of a planet". CalcTool. Retrieved 12 September 2010. ↑ "Mir Space Station Observing". Satobs.org. 28 March 2001. Retrieved 12 September 2010. ↑ Mark Wade (4 September 2010). "Baikonur LC200/39". Encyclopedia Astronautica. Archived frae the oreeginal on 24 August 2010. Retrieved 25 September 2010. ↑ Mark Wade (4 September 2010). "Baikonur LC81/23". Encyclopedia Astronautica. Archived frae the oreeginal on 1 February 2010. Retrieved 25 September 2010. This page wis last eeditit on 15 October 2017, at 01:05.